British Airways' (Comair) pet travel policy ensures that the greatest amount of care is taken to look after your pets when you need them to travel with you. Pets won't be accepted to travel in the cabin with their owners, but can travel in the cargo hold, with the same temperature and pressure experienced by their owners in the passenger cabin. Only small animals; such as dogs, cats, birds, reptiles and tropical fish will be accepted. Larger animals, such as horses, can be carried by BA's freighter services only. 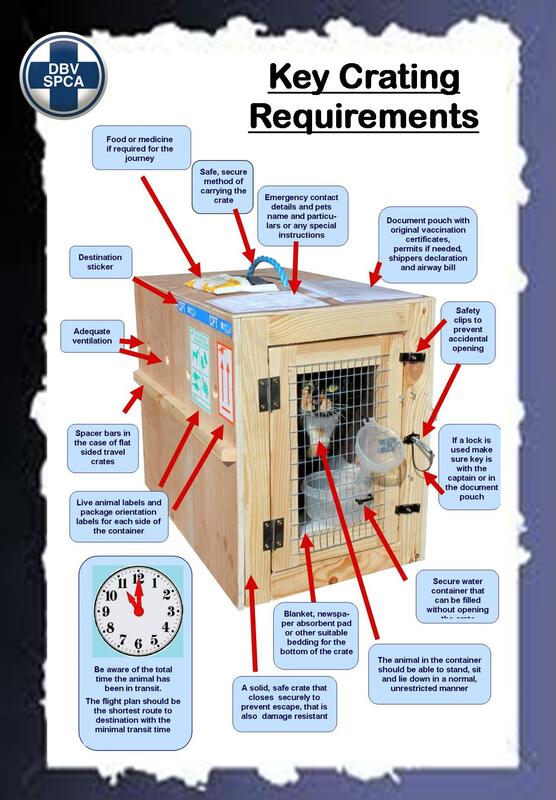 Owners must ensure that the pet is carried in a safe and humane container made of a material strong enough to protect your pet, big enough for the animal to stand up and turn around and lie down in a horizontal manner, has sufficient ventilation holes on all 4 sides which are not big enough for the animal's nose or paws to fit through, the door is secured properly and the container has a water and a food bowl accessible from the outside. Click on the image below to enlarge and to see all the tips from the SPCA. Owners must ensure that their pets have valid health and vaccination certificates, entry permits and other documents required by law. You can find all the latest requirements, as in August 2016, here. The animal is not suffering from any disease or injury, is not pregnant, does not show aggressive behaviour and is at least 10 weeks old. Runway temperatures are not above 29 degrees Celsius or below 7 degrees Celsius at the time of departure. The number of animals that will be accepted for carriage is restricted on each aircraft. The amount that you will be charged to travel with your pet will depend on the size and weight of the container and your pet, as well as the distance travelled. The rate per kilogram at the time of writing is R25, which includes the weight of the container with your pet and its food. Additional handling charges and local government and customs charges may apply. The charges will be quoted at the time of booking, at a maximum of 14 days prior to travel. Bookings for your pet to travel with you need to be made in advance. To book your pet call British Airways at least 72 hours prior to departure on 0860 I FLY BA (0860 4 359 22). Passengers with disabilities, who require the services of a guide dog, can request to travel with their service animal in the cabin. British Airways offers this service free of charge. They suggest that you bring a dog car safety harness to secure your dog during take off and landing (a collar and lead are not acceptable) and a vet bed for long haul flights. To book travel with your guide dog, you should contact British Airways on 0860 I FLY BA (0860 4 359 22) at least 7 days prior to travel. No online check-in is allowed, as full travel documentation will need to be filled out before going through airport security. Never give them a sedative. Take your pet for a health check-up prior to flying. Hydrate your pet well before travel. To book a flight for yourself on British Airways click on the link.